This film has its moments, and it is entertaining throughout, but it loses its way toward the end and becomes a bit absurd. This film is funny, there are laugh out loud moments, which was a pleasant surprise considering the recent trend in big budget Hollywood hero movies of going darkly serious. This film does a good job at times tiptoeing the line between drama and comedy. It never gets to the point where it starts to feel too serious, which would be out of place not just for Tony Stark, but for the Iron Man series as a whole. 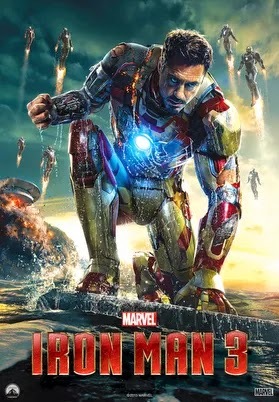 I was not alone in being disappointed with Iron Man 2, so I wouldn't have blamed them if they had tried something new, but they stuck to a more familiar tone, and for the most part it worked. That doesn't mean that this film is exactly like the previous Iron Man films. This film does dial down the AC/DC while dialing up the jokes and that makes it enjoyable enough to watch just to listen to all the witty banter. This is also one of those super hero films where the hero spends less time in his hero suit, and more time proving he is an action hero regardless. However, his arsenal of suits has grown substantially, and if his numbering system is any indicator of the amount he has created we can assume he has as many as 42 of them. Coming off of what he did in The Avengers, he finds himself dealing with the occasional anxiety attack. He is now a shakeable man, but curiously they never use this in conflict with the villain. Whether you think that's a good thing or not, it does seem strange that they bother to establish the anxiety attacks, but don't seem to do anything with them, they make more of a joke out of it rather than trying to use it to give Tony Stark flaws. It's as if they needed some way to connect this film with the material that has come before, but sadly it's a minor side note more than anything else. Stark also finds himself unable to sleep, which affords him lots of time with which to build those 42 different versions of his Iron Man suit. Fairly early on we are introduced to the idea that Tony can also control those suits remotely, which of course comes back into play a number of times, but sadly only serves to distance Tony Stark from Iron Man. It gives us the sense that may not even be needed. It isn't bad that Tony Stark has to work without his suit, because in his suit most enemies are no match for him. Having him outside his suit makes him vulnerable. However, there's something lost when the suits go on fighting without him. From this we can see a future in which an automated set of Iron Man suits are programmed to keep the world safe and Tony Stark can retire and spend his days observing the systems in some control room to make sure things continue to operate as expected. In the meantime, of course, Pepper isn't too pleased with Tony's lack of sleep and attention, but he assures her that his restlessness is tied to his fear of losing her. The villain, called The Mandarin (Ben Kingsley), is not what he seems. It's humorously done, but ultimately kills what could have been a great villain. Aldrich Killian (Guy Pearce), on the other hand is turns out to be the brains of the villainous operation. His proposal to perfect mankind by enhancing the human body is snubbed by just about everyone. Yes, the villainy boils down to another project to create super soldiers. I suppose it makes sense, considering the projects that created some of The Avengers, villains would be attempting the same thing. He disguises his procedure as a treatment for amputees that will allow them to regrow limbs, recover quickly from injuries and grants super-human strength so that he can attempt to gain more funding for his project. What he doesn't share is that it has some nasty side effects, the main one being that if the body rejects the procedure it explodes. Why does it also involve the ability to create fire or melt things with the touch of a hand? That never seemed clear to me. Also, why does grabbing onto an Iron Man suit with the ol flaming hand trick seem to shut down the suit's systems? It's an unexplained power that seems to be able to do whatever they want it to. Those questions aside, all of this is building to a gigantic battle featuring Killian and his super soldiers vs Tony Stark's army of Iron Men. This is where it goes off the rails. After having spent a good portion of the film forcing Tony to work on his own without his suit, the final showdown comes down to a giant battle featuring automated suits, effectively taking Stark out of the situation. By now we should be growing tired of the big budget blockbusters coming down to giant battles that cause widespread destruction. The one found here is a pretty empty/faceless (considering it's Iron Man suits on auto-pilot vs a crowd of random super soldiers) battle that only serves to distract us with more explosions in order to fill out the runtime, when they could have just given us the fight between Iron Man and Killian because those are the characters we know and want to see. This being a follow up to The Avengers (and this is going to be a problem with all the new super hero films after The Avengers), we have to wonder, why don't they just call in the other Avengers? I'm sure we are supposed to assume that all these heroes have their own battles to fight and are all busy doing their duty to protect humanity somewhere else in the world, but shouldn't there be some crossover? Perhaps I'm asking too much, but if these stories are happening at the same time Tony Stark could look up and see a report on TV that say Captain America is dealing with something somewhere in the world, like a reflection of what's to come in the next Captain America film. Tony Stark is clearly in trouble here, they assume he is dead at one point, and the villains are dangerous, on a global level, and yet there is no word from SHIELD or any of the other Avengers. 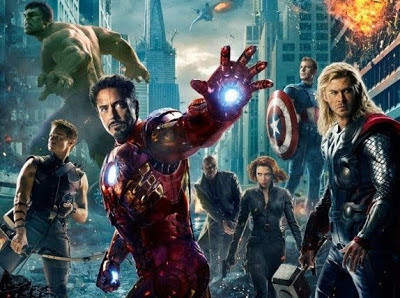 I know this is an Iron Man movie, but they are clearly pushing for a unified world featuring all the heroes that make up The Avengers and yet the others are strangely absent from this film. However, having said all of this, I should mention that I was entertained by this film. For all its faults, it is an entertaining film. In fact, much of the first half of the film is quite good, it just leads to a slightly disappointing ending. It's better than Iron Man 2, but not as good as the first one.